The fabric for this runner was chosen by my mom when our family was in Minnesota last spring. We had looked several times for red and black fabrics to make a runner for her good friend. So when we saw some we really liked, we grabbed it! I gave mom her choice of quilting designs, and she suggested a swirly meander. Ok, that's great but. I'd only done that once before. Even so, I think it turned out pretty good. Table runners are a fun finish, and this one was no exception. Yay. Looks great, Debbie! That is a fun pattern and I think your quilting looks wonderful! I really need to try that design sometime. It's wonderful! And I agree, smaller projects like these are so much fun to finish! Hope your mom loves it! This is such a pretty pattern! It will be well received, I'm sure! 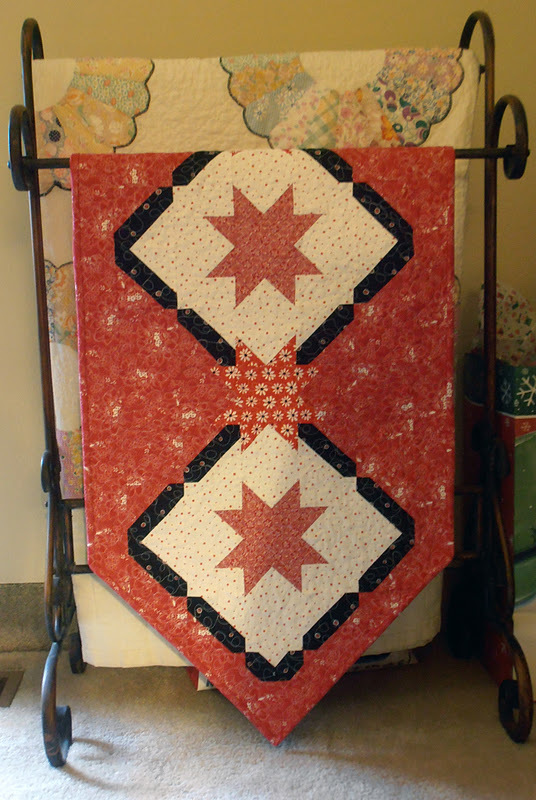 It turned out beautiful and the quilting looks great! Nice finish Debbie! I'm sure your mom's friend will love it.